I am so excited about my performance and what I have achieved in London. Two personal best over 50km’s in 13 weeks is fantastic. I am incredibly humbled to be an Olympian. I hope that I will Inspire the next generation. After years of dreaming and training, realization dawned for me in London on Saturday 11 August when I left the Games Village at 7am, bound for the Mall and the start of my 50km race walk (25 laps of 2km) at the 2012 Olympic Games in London. My training had gone really well in the build-up to the race, having only qualified 13 weeks earlier on 13 May in Saransk. 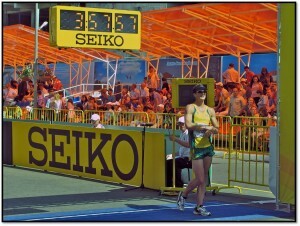 My personal expectation coming into the race was to achieve a new personal best at the Olympic Games. As the only South African and African athlete participating, a new PB would achieve both a National and Continental Record. I set my goals on walking close to 3 hours 55 minutes and together with my coaching and medical staff, prepared for the goal. 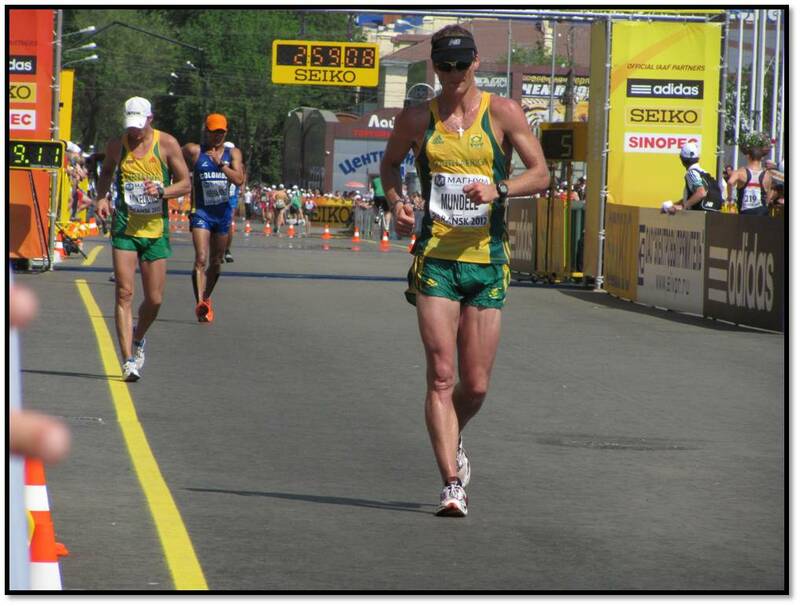 I was determined to walk negative splits and to finish well; an improvement on my performance in Russia. I was very confident with my training, having recorded better interval results and faster distance sessions in the build up. Having finished 4th at the Africa Championship in Benin in the 20km in June, I was confident of my form going into the Olympics. I prepared well at the hpc in Pretoria, undertaking a two week training camp at altitude prior to departing for London with Team South Africa on 19 July. I enjoyed the holding camp facilities at St Mary’s University, where the athletics team was based until 30 July, where after we moved into the Games Village. Although the Games Village is a wonderful environment, it is difficult to get into a training routine and to remain focused whilst everybody is finishing up and celebrating. Remaining focused was the greatest challenge and I ensured that I trained outside the village at Newham Community Center (25 minute bus trip) or in Victoria Park (3.5km walk each way). Although it was difficult not having a walking coach available to analyze my technique in the final weeks, I was able to meet up outside the village and occasionally in Victoria Park for technique sessions. Other challenges were the dining hall, which was a necessary evil, providing copious amounts of food and varieties for all nationalities throughout the day. It can be so easy to overindulge because it is available. I had my very own South African outpost on the course. So many people congregated around my Family and then along the course there were South Africans in the crowd waving flags, holding up banners, shouting and cheering throughout the race. Friends, family and proud South Africans were strewn along the 2km course, which commenced on the Mall and headed past Buckingham Palace, turning on Constitution Hill. Several South Africans had tickets along the Mall and it was wonderful to embrace all the cheering and encouragement. I received so many sms’s, facebook post, emails and phone calls to wish me luck. I enjoyed my race, which went according to plan for the majority of the race. They key was starting slow and building throughout the race, keeping a very constant pace and aiming for something close to 3:55:00. I was difficult to be so far back early on in the race, but I managed to move through the field in the second half, recording negative splits as the fast pace early on in addition to the heat took its toll on many of the athletes. I walked with Brendan Boyce (IRE) and Quenten Rew (NZ) for most of the race. We altered lead positions within our group and in the end both of them finished just ahead of me with PB’s. I was tremendously happy with my PB, National Record and Area (African) Record. It was wonderful to compete at the highest International level and to achieve a PB. It was incredible to be in a race where the first 25 athletes finished under 3:50:00 and 40 athletes finished under 4 hours. With my time of 3:55:32, I could quite happily stop competing with this as my lasting memory and final 50km race – only time will tell. My time however is an IAAF A standard for the IAAF World Athletics Championships in Moscow next year. My personal race splits from yesterday’s race were very consistent and very even. I was delighted to negative split given the racing conditions. 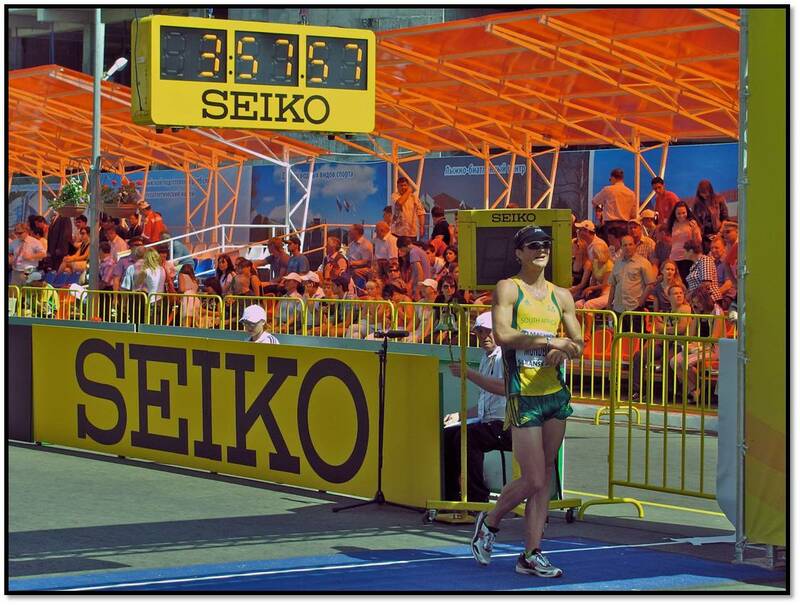 After the race, I didn’t get any muscle cramps – which is testimony to my improved nutrition and conditioning. I was also well looked after by the SASCOC medical team on the day and in the days preceding the race. I had received numerous sports massages and strapping as required, in addition to ice baths and posture corrections. The SA medical team on the day also ensured that my blisters were cleansed after the race and helped with a rub down, prior to accompanying me to doping control. I was elated that I provided the minimum requirement of 90ml well within 4 hours of completing the race – This was necessary to ratify the new Record. My dream is that my performance may inspire other South African walkers (and athletes) to follow their dreams to Rio and 2020. To young Pierre Vermaak, you have the platform and the opportunity to excel and your time will come in 2020. To all my training partners, follow your walking dreams firstly to Moscow next year, then to Beijing in 2015 and finally to Rio. May it not be another 52 years before a male athlete represents South Africa at the Olympics. Wayne, Pierre, Lebo, Armond — It is possible!!!! Thank you to Mom, Dad, Taryn, Jo and Chris for buying flight tickets to come over from South Africa; Jamie Costin who came over from Ireland and Anton who came over from Germany to support me – I will forever treasure and cherish your unwavering support and encouragement. Thank you to everybody that has supported me. I am staying in London for a couple of days and will return home over the weekend.